Renaissance festivals have become popular throughout the United States. Each August through October since 1977, the Maryland Renaissance Festival has re-created a 16th-century English Tudor village in the era of William Shakespeare, Edmund Spenser, Thomas More and Henry VIII. The village, built on the grounds of the Anne Arundel Fairgrounds attracts an average of 14,700 visitors each day. As summer ends, the 27-acre English Village of "Revel Grove" comes to life with more than 200 professional performers on ten stages, authentic combat armored jousting on magnificent steeds and streets filled with village characters. A tradition for the entire family, the Maryland Renaissance Festival runs Saturdays and Sundays and Labor Day Monday through October 2, 2018. Festival-goers can join His Most Royal Highness King Henry VIII in the forests and glades with over 140 artisans exhibiting crafts in their own renaissance shops. You'll not go hungry or thirsty as there are five taverns featuring cool libations, and 42 food and beverage emporiums providing a vast array of savory and sweet treats. You'll dine on smoked turkey legs, fresh crepes, succulent ribs, fresh seafood, and sandwiches. Wash that all down with an array of ales, ciders, and wines. Visitors can dress in Renaissance-era costumes (they rent them at the festival) and look the part as they enjoy strolling the streets, watching live performances on 10 stages, and happening upon dozens of intriguing street acts in the English village. You'll be surrounded with action in a village full of stilt walkers, beggars, hermits, wenches, pickpockets, and rogues for an immersive entertainment experience. Take a break and listen to Renaissance music. 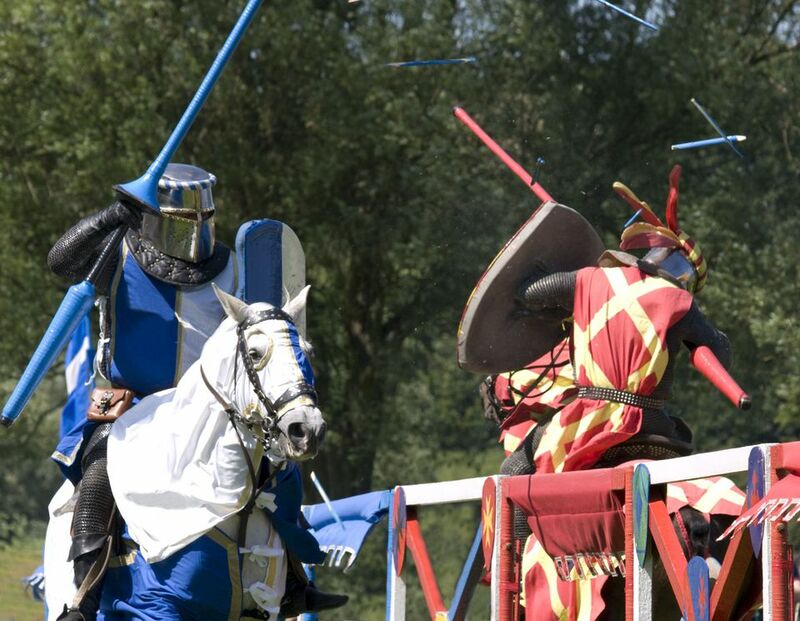 A must-see is the jousting troupe from Debracey Productions with a field full of horses, men in armor, chariots, trick riding and thrills for all ages. Shop at the more than 130 craft shops for stained glass, sculptures, jewelry, pottery, wood-butchery, leatherwork, inlay work, clothing, and glass-blown creations. There's fun for everyone, even the littlest ones, with child-friendly activities such as free pony rides, a maze, archery, a play area, and dozens of games. The 2018 Maryland Renaissance Festival takes place at Anne Arundel Fairgrounds, located at the intersection of Route 450 and Crownsville Road in Crownsville, Maryland (8 miles northwest of Annapolis). Admission is $19 from August 25 to September 9 and $26 from September 15 to October 21. All senior, child and group tickets are discounted. A two-day pass is $38 for the run of the festival. Parking is free. At the entrance to the Maryland Renaissance Festival, you will receive a guidebook with a map. The map is not easy to follow, so if you have questions ask someone in costume. Look at the schedule and plan to attend the jousting. These exciting shows are only offered a few times a day. You cannot bring food and drink into the festival (one bottle of water is OK). Come hungry and enjoy the food. There's lots of variety, and the prices are reasonable. Bring cash. All beverages, food, and games accept cash only. Relax and enjoy some of the shows. With shows on ten stages, you won't be able to see all the shows in one day.